By Jake Adams One common comment that I frequently receive from prospective buyers of LED reef lights is a fear that the technology is moving so fast that a significant investment today will be quickly eclipsed by new lights and technology in the near future. Although it is true that LED research in the lab is producing new breakthroughs on a regular basis, the manufacturers of light emitting diodes can only move so fast; now they seem to have settled into releasing higher performance LED packages on an annual cycle. LEDs are maturing very quickly, and it won’t be long before the entire aquarium hobby has LEDs on its radar. That being said, the value of LED lighting has been at a great cost-performance ratio for some time now. 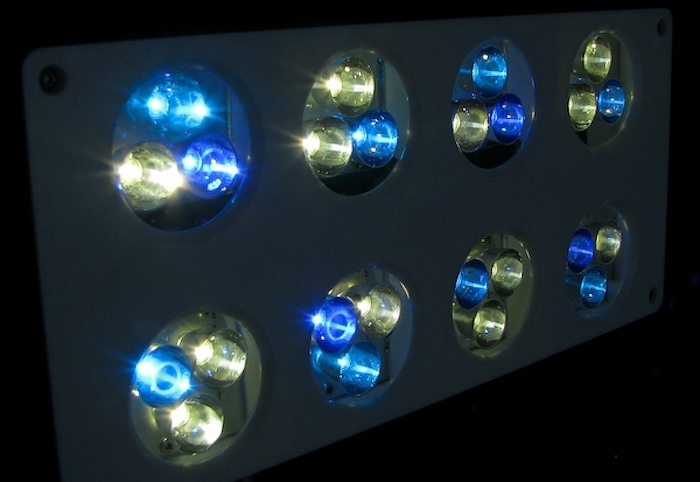 The manufacturers of LED aquarium lights are all releasing, or have released second and third generation versions of their lights, which address some of the initial trade offs of performance and cost. 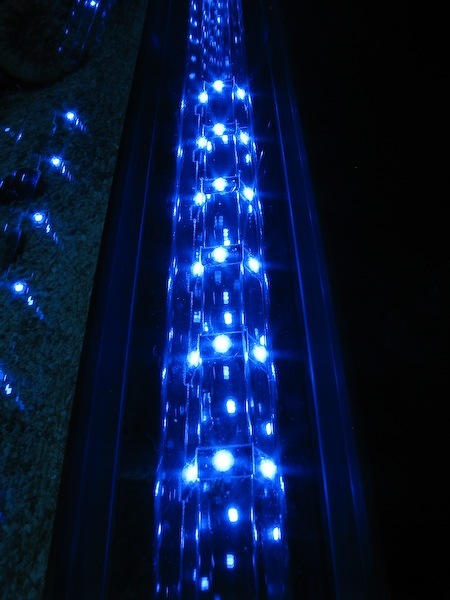 Today’s current offering of LED lights are all very good and suitable for lighting all but the largest of reef tanks. Instead of telling you about all the different LED lights on the market and dissecting them one by one, I wanted to write a primer on what to look for in an LED light so that you will be able to make an informed decision if you should take the plunge into this exciting new world of efficient and long lasting aquarium lights. When the first reefer was handed a metal halide bulb, he or she probably had less than half a clue as to what was the best way to install and operate the light over an aquarium. Through trial and error we figured out to mount the light in a canopy or pendant, to which a flat metal reflector was added to reflect light back into the tank, and then a parabolic reflector. Over time, we came to realize that four facets in a reflector would collimnate the light better than a parabola, and nowadays an eight-faceted reflector is pretty much par for the course when it comes to a high quality metal halide reflector. Through different bulb colors and ballasts we learned to fine tune the performance of metal halides even more, and now we know enough about HID lighting to make it work on a wide range of tanks. What I am trying to get at is that LEDs and other forms of lighting are being developed first for general lighting applications and it is up to us, the aquarium community, to figure out how to make it work for our applications. Now that LED technology is becoming widely available, it is once again up to us to collectively learn how to make it work for our aquariums in terms of intensity, color rendition, efficiency, heat and longevity. This is a Cree XR-E LED showing off the single primary optic. LEDs have been around for decades, since they were first used as indicator lights with barely enough light to glow. Over time, LEDs have evolved to a myriad of types for different uses and intensities. The first evolution of the small indicator LED is the 5mm LED. 5mm LEDs are only slightly brighter than their indicator predecessors but since taking their place, they now make up about 80% of world LED production. With those kinds of numbers, it’s easy to see why 5mm LEDs are inexpensive, but they really do best at providing moonlighting for reef aquariums at most. Some products are available which clusters the 5mm LEDs into decently bright lighting; but 5mm LEDs were never designed to be a “shining” light and therefore do not last very long when used as a primary light source. Low output LEDs are now being incorporated into even the most basic all in one aquarium set ups like the Eclipse tanks by Marineland. Medium output LEDs are those which run at about 0.25 watts, and they normally do not produce very much light. These bulbs are found in flexible LED strips, but what makes the medium output LEDs great is their low profile. 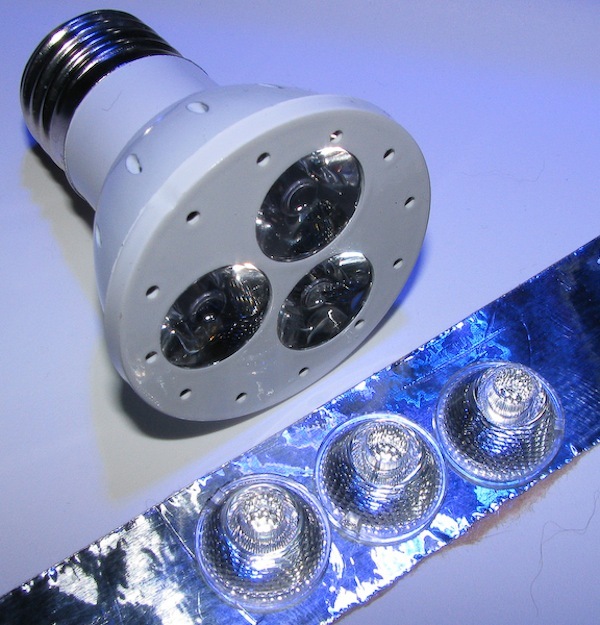 Medium output LEDs are very robust, and because of their low profile, some thin lighting strips such as the Ecoxotic Stunner have packaged the medium output LEDs in an epoxy in a process called “potting.” A completely potted LED is very water resistant, but the epoxy also limits the amount of heat that the medium output LEDs can produce. One type of medium output LED is the RGB LED, which includes red, green and blue emitters in the same LED package. The red, green and blue light combine to produce white light with a very high color rendition. At present, RGB LEDs can make good accent lights for reef aquariums, adding a splash of color to the normal blue and white lineup, but for the most part, they are still insufficiently bright to drive photosynthesis of corals in anything larger than a smaller nano reef aquarium. 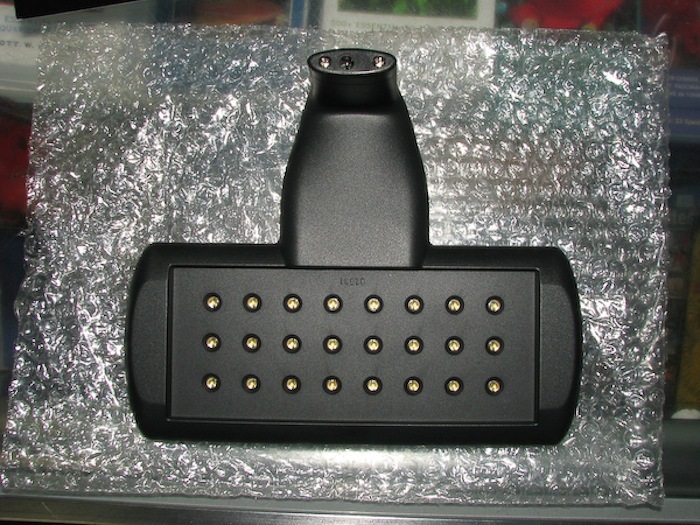 The Mame Design Ecolyte is an example of a 50 watt RGB light which is the first serious attempt at packaging RGBs into a light which is good enough for reef lighting purposes. The Mame Ecolyte is the only real reef level light that uses only red, green and blue LEDs. When it comes to LEDs, the real action doesn’t start until you start using high power LEDs, the likes of which are dominant in most reef level intensity lighting fixtures. High powered LEDs are those which are driven with amperages from hundreds of milliamps all the way to one amp, or anywhere between half a watt to three watts. 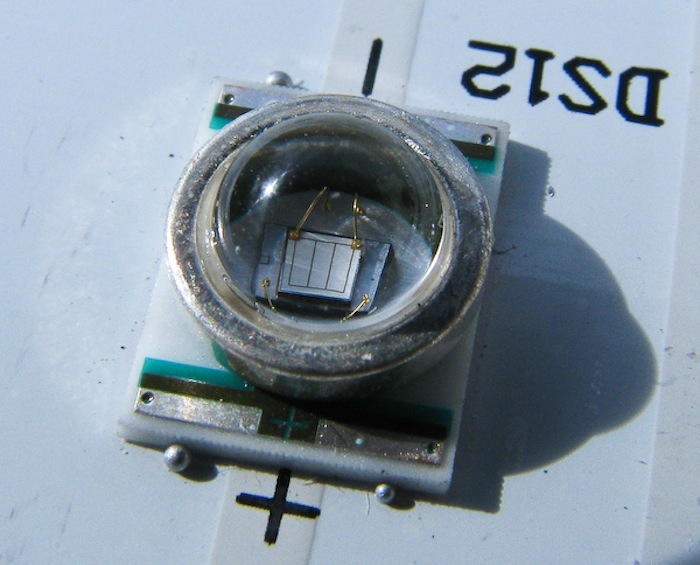 These LEDs produce a lot of light for the power they consume, currently producing the most PAR per watt but not necessarily the most PAR per dollar. The value in these high output LEDs comes in their longevity which can be as high as 70% intensity after five years of use. High power LEDs are not only getting brighter but they are also getting smaller with the latest generation of Cree and Phillips LEDs being about one quarter the size of their predecessors. The smaller footprint makes it easier and cheaper to outfit them with optics like lenses or reflectors, and it also makes it easier to package them into smaller and thinner fixtures. 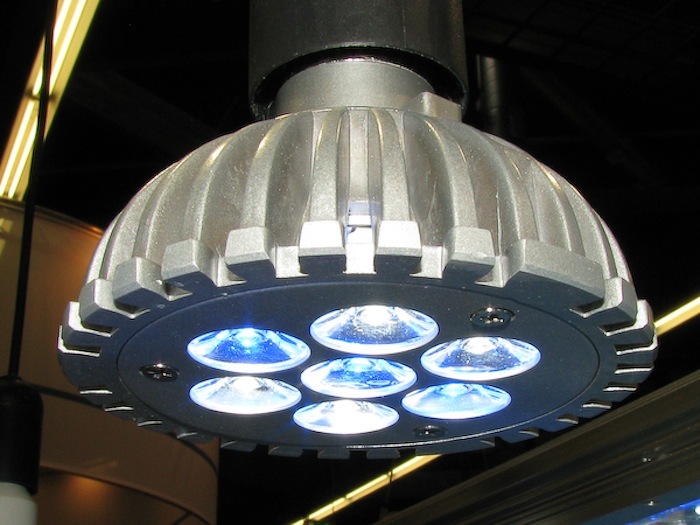 The LED Cannons from Ecoxotic are the first Multichip LED pendant to be designed for the aquarium market. 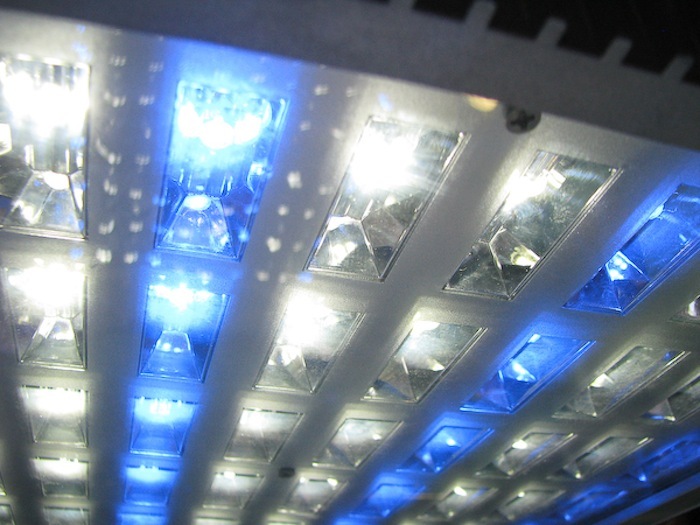 The next crop of LEDs are being packaged into clusters called multichip LEDs. 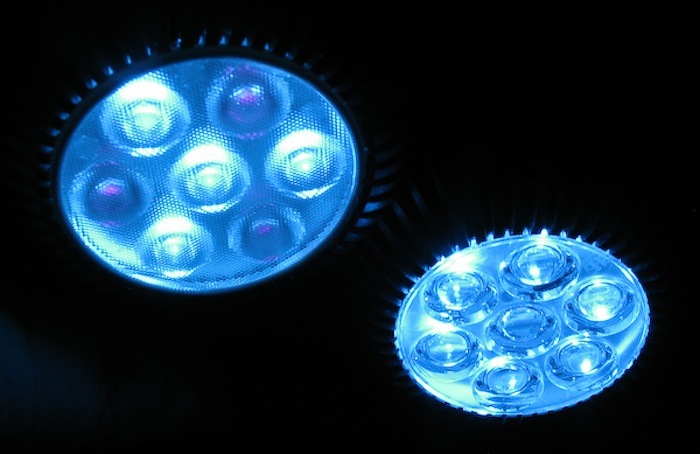 Multichip LEDs are similar to multi-core computer chips in that instead of trying to get higher and higher brightness from the LED, multiple LEDs are being bundled into groups of five to 100 one-watt LEDs. Multichip LEDs offer a good value of cost and performance; they are not as efficient as groups of individually packaged LEDs, but they cost a lot less for the equivalent amount of power. Multichip LEDs are still so new that only a few companies are beginning to make them into reef aquarium light fixtures, but the future of reef lights will certainly include multichip LEDs with more frequency. This AquaMedic LED spotlight has a lot of mass in it’s heatsink but only a modest amount of surface area. 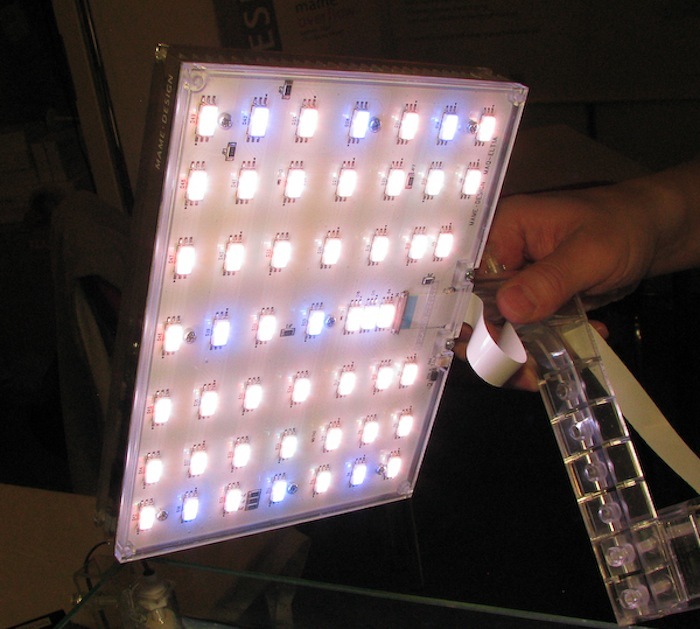 Thermal Management: Keeping LEDs Cool If making an LED light was as simple as slapping some LEDs into a box and sending it on its merry way, LED lights would have already overtaken conventional lighting in the aquarium world. Alas, making an LED light that lasts is not that simple, and it takes very careful design and testing to manage the heat which is produced by LED lights. LEDs are very efficient and they put off less heat per watt, but the higher the running temperature, the more quickly the LED will degrade. The name of the game for an LED light is to manage the heat they put off by using a heatsink. Heatsinks, which have a balance of mass and surface area, are an extremely important part of LED lights. A properly designed LED fixture will include a significant amount of metal, usually aluminum, to which the LEDs are mounted so that the heat can quickly transfer to the mass of the metal heatsink. Having a large mass allows the LEDs to quickly transfer heat away from the delicate emitter, but the mass of metal must also be able to rid itself of heat. Once the heat is transferred to the mass of the heatsink, heat is transferred to the ambient air which is why it is important for heatsinks to have a high surface area. The more surface a heatsink has, the more quickly it will be able to shed heat to the air; if the heatsink is cooler, the LEDs that are attached to it will also be cooler. Some heatsink designs may favor a large amount of mass or a high surface area, but in general it is best to have a balance of both mass and heatsinking area. In some cases, the heat generated from the LEDs may be so great that it is necessary to actively cool the heatsink with airflow from fans, and some future designs may even employ liquid cooling, the likes of which are commonplace in high performance computers. 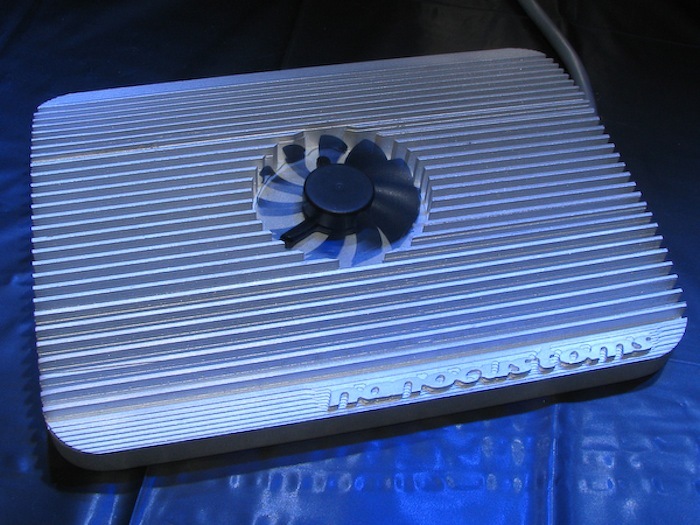 This high end LED light from NanoCustoms is made from all Aluminum and it includes a lot of mass, a lot of heat sinking and a fan to actively cool the unit. A small assortment of different LED lenses, some of which are using different types of diffusers. Directing the light: bare LEDs, reflectors and lenses, diffusers: A bare LED is just a small square diode which shines light over 180 degrees with a gaussian distribution. This Gaussian distribution means that the light coming from a surface shines evenly in all direction. This is great for general lighting application, but for reef lighting we need to focus as much of the light which is produced as possible. Nearly all LEDs are built with a primary optic, a lens which both protects the LED from moisture and mechanical damage and gathers 180 degrees of light into a more narrow 120 degrees. I say almost all LEDs because half watt and RGB LEDs are usually provided with a lens that simply protects. These LeDio spotlights are identical save for the earlier version which has no diffuser on the lens. This basic LED with a single primary optic is a great way to light up smaller tanks, and medium to large tanks with a relatively modest lighting need. For more demanding applications, the most common practice is to add a secondary lens to further capture and direct the light. Secondary lenses can take the 120 degree light field of the primary optic and focus it anywhere from nine degree laser beams or 90 degree swaths which are only a little more focused than the primary optic. Furthermore, some lenses have a built-in diffuser in the end which is sometimes included to better blend the light field. The secondary optic and inclusion of diffusers help to make a more even light field, but these both reduce the light being emitted, and they reduce the shimmer effect that comes from having point source lighting. One manufacturer, Sunbrite LED, has come up with a novel solution to this dilemma by developing a custom primary optic. Sunbrite’s custom primary optic has a light spread of sixty degrees, eliminating the need for a secondary optic, and it is still small, so it produces shimmer like a more focused point source of light. The Sunbrite LED strips have a novel primary optic with a directivity of 60 degrees. The individual reflectors of this AquaMedic LED light are extremely efficient at directing the light of each LED. Another way to direct the light of LEDs is to use reflectors. Reflectors are great in that they have less light loss than lenses; they preserve the shimmer that comes from point source lighting but they so far have not been very widely used in LED fixtures. Secondary lenses are a great way to customize your existing LED light to suit a range of needs. However, when you’re talking about outfitting a large fixture with dozens upon dozens of individual LEDs, at roughly $1-2 each, secondary lenses are not practical for outfitting very large tanks. The cost of producing lenses is also much higher than the cost of making reflectors. Some LED striplights are beginning to incorporate a common reflector, but eventually we should see more LED lights using common reflectors for directing the light from each individual LED much the same way we expect a higher end T5 fixture to have individual reflectors for every lamp. The Reefbrite LED striplight is one of the few that exclusively uses a reflector to direct the LED light. Form Factor: pendants, strips, fixtures, spotlights and retros Metal halides are big and bulky, so they have to be packaged in a sufficiently thick pendant; but fluorescent lamps like VHO, T5 and power compacts are long and narrow, so they are better suited for striplights and retrofits. You couldn’t take a metal halide and put it into a striplight, nor does it make much sense to stuff short fluorescents into a pendant. However, unlike the size constraints of conventional lighting, LEDs are square millimeters at their minimum and they can therefore be packaged into every form factor imaginable. For many people, the first dip into the LED lighting world is through the use of LED spotlights which have an incandescent base and can be added to most existing lighting setups. LED spotlights to date have all been outfitted with secondary lenses to help focus the light, hence the “spotlight” moniker. The directional light of LED spotlights allows new LED users to familiarize themselves with LEDs, a few spotlights and a modest investment at a time. LED spotlights come in a range of colors and power levels but they are great for just adding a little accent lighting to a prized coral or for producing really dramatic lighting effects on a nano tank. Spotlights in particular are often amenable to having LEDs swapped with broader or narrower lenses. I have had pretty good luck lighting up nano tanks with spotlights, but when it comes to an aquarium with a surface area over 18”, it becomes difficult to produce a nice, even light field through the use of LED spotlights. Many LED spotlights have lenses which are accessible and easy to interchange. Besides spotlights, LEDs can be stuffed into the normal strips, pendants and fixtures that we are used to, but LED flavors of these have already begun to be manufactured in specific ways. For smaller lights, it makes sense to mount all of the LEDs to a circuit board; but for larger fixtures there are some trade-offs. Sure it saves money to mount all the LEDs to one big circuit board, but if one or more LEDs begin to fail, then there will be very little recourse for repairing a single defective LED. Many of the mass-produced LED lights which are being imported into the US from China are of this version. A better option is to produce large LED lights with an assembly of LED modules which can quickly and easily be swapped out or replaced without having to take the entire light out of commission. The modules can be arranged into strips or pucks with a few to a dozen LEDs. At least one newer light, the latest generation MaxSpect, have LEDs that are each individually mounted to their own little circuit board. Having fewer LEDs riding the same circuit board makes it easier to not only replace LEDs when they are faulty, but in the future it will also make the fixture more upgradeable to new and better LEDs, or simply to mix and match LED colors to your liking. 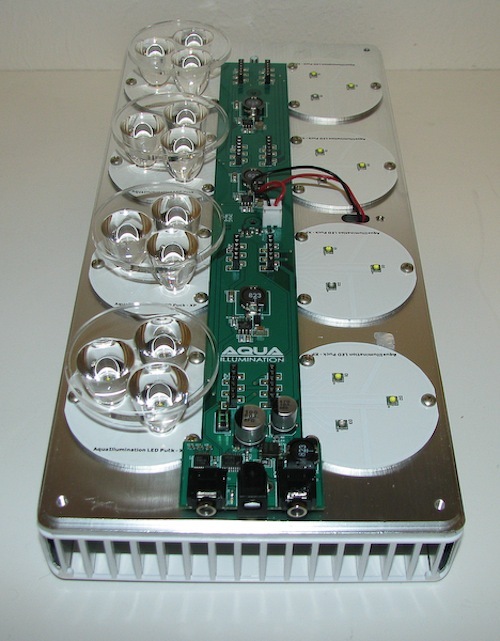 The Aqua Illumination LED is a versatile, modular LED fixture with changeable lenses and LED pucks. The Panorama LED module from Ecoxotic is easy to use as a stand alone or accent light for marine and reef aquarium tanks. Color Rendition: blue is royal blue is cyan By now you may have noticed that I spend very little time harping on how efficient LEDs are or how long they last. Sure it’s nice to have a lower electricity bill every month, but for me the LED epiphany came when I first succeeded in getting the right color combination of LEDs that made my coral colors pop like nothing else. Without exaggeration, I do believe that someday we’ll be able to make LED lights with color rendition that absolutely trumps everything just shy of a double rainbow of T5 tubes, yet which use only a fraction of the energy of conventional lighting. Although that day is not yet here, LEDs are pretty freaking awesome when it comes to blue light. The tricolor pucks in this Aqua Illumination LED shows the difference between blue and royal blue LEDs. Not only are LEDs great at making blue light, but they already exists in a few different shades of blue which are analogous to many of the colors we are already familiar with in T5 and VHO fluorescent tubes. Royal Blue, blue and cyan are three fairly discrete colors of LEDs that have emission spectra with peaks that are right in line with the wavelengths necessary to excite different fluorescent pigments. For example, royal blue LEDs have a peak emission near 455nm which appears deep blue like an old school actinic O3 lamp. Blue LEDs have a peak emission closer to 470nm which is very comparable to the blue plus lamps that bring out the really crisp fluorescent colors. Even if you are not yet in the market to overhaul your entire reef aquarium light, with many all-blue LED striplights now available in both blue and royal blue, there’s no time like the present to take advantage of the high quality blue light that LEDs can produce. Although this article is rather long, I feel like it is still just barely scratching the surface of what there is to know about LED lighting. Two fairly important points that are beyond the scope of this LED primer article is the concept of LED drive current and the properties of the light field emitted by LEDs using lenses. Thankfully, These two topics have been thoroughly smothered and covered by CoralSky’s Jeff Littlejohn who expounded on these two ideas in two separate posts on Reef Builders. If you want to know why a three watt LED is only twice as bright as a one watt LED, head on over to Jeff’s explanation of LED drive current http://reefbuilders.com/2009/12/21/u…drive-current/. If you want to know more about why a 60 degree lens is throwing most of its light over 45 degrees, take a gander at Jeff’s writeup on LED optics explained http://reefbuilders.com/2010/01/27/l…s-explained/. * There is still very much to learn about how LEDs run conceptually and even more for us to discover about using LEDs to light up reef aquariums. I hope this primer article on the basics of LED lighting will help you feel more comfortable about making an informed decision for your next lighting purchase, whatever that may be. It is an exciting time to be a reef aquarist because our knowledge and understanding of LED lighting for driving photosynthesis is still in its infancy, and at this point any knowledge gained will contribute significantly to the bigger picture. The future of LED lighting which has been on the horizon for decades has finally arrived. The future is now and it’s up to you to decide if you’ll be part of the movement to help further our common understanding of exciting and versatile LED lighting technology.